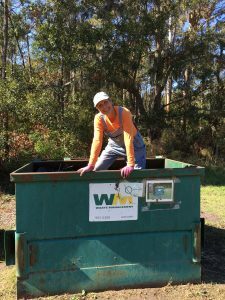 Farmer Jane doing the dumpster dance! 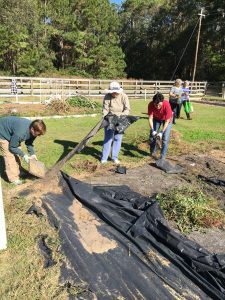 Nineteen volunteers showed up early Saturday morning to weed and clean up the north end of the farm and parts of the organic section. It was truly wonderful to see how that many folks can make a difference in such a short time! The Farm looked so much better after a few hours! Spring clean up will be another opportunity so we thank all of you who came last Saturday and hope to see more of you in the spring! Local Skidaway Farms Honey for Sale. Our resident beekeeper, Barbara Phillips, aka Dr. Ra Ra, will be at the farm from 10 am until noon on our farm clean-up morning, Saturday, November 19th! Barbara has more of her delicious, farm honey to sell. Skidaway farms honey is the best hostess gift to give for the coming holiday season. Everyone loves it!!!! Plus it has been suggested that eating local honey from our very own farm can reduce allergy symptoms from pollen. Hello to all the farmers and a special thank you to those who completed our springtime survey! I know, I know, it’s fall now but better late than never! Wanted you all to know that there was great feedback from the farmers and we, the board, appreciated all of your responses, comments and suggestions. Most of all, we appreciated all those who volunteered to help carry the workload of the Farm and keeping it running smoothly. High marks were given for the maintenance of the Farm with two issue most problematic: the road ruts at the entrance to the parking lot and poor drainage in some of the plots and areas surrounding plots. As you know, the road repair was finished in the summer by the Landings Association with no cost incurred by the Farmers. Thank you Landings Association! The drainage problems continue to be monitored and various methods to fix these have been discussed. No inexpensive farm-wide solution has been found yet. For now, farmers will need to address the drainage problem of their plots on an individual basis. Many farmers employ deep trenching and building up of their plots to facilitate drainage when experiencing heavy rain. Management received good marks from the Farmers with a few issues that could be improved. Communication could be improved with many of you unclear as to how and with whom to communicate. Many of you would appreciate more educational opportunities at the Farm. 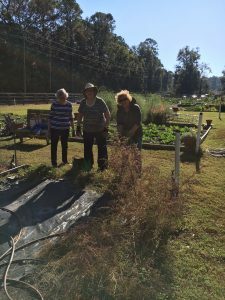 Suggestions regarding more info in the TWATL and Skinnie about the Farm both as a marketing tool as well as an educational/informational resource. Hose bibs were problematic in some plots in two ways: not plentiful enough and not in the best location, often obstructing the use of carts in the plot. Drainage problems were cited as a continuing problem. Neighboring Farmers were most frequently cited in complaints regarding weeds. Thank you again for all your responses and your involvement with our community farm. We will be finding better and more frequent ways to communicate with you all over the next few months. Also asking for your help in the coming weeks with some fall cleanup mornings! Happy planting!